A very elegant pair of gilt metal and black glass side tables. French, circa 1970s. Will complement both a classical and modern interior due to its timeless classic design. The tops have been replaced as the originals were damaged. The metal work has good patination. There are some marks of oxidization which should be visible in the photos. The glass tops are new replacements so in very good condition. A painted black iron two-tier side table. With circular Carrara marble top (replaced) and clear glass shelf. Designed by the French, 20th century designer Charles Ramos. A fabulous off white and gilt metal curved illuminating wall mirror attributed to Jean Perzel. French, circa 1970s. Wonderfully decorative. Paar blau lackierte Beistelltische mit Messingdetails und einer Schublade. Der Lack wurde durch uns erfrischt. Dieses Paar runder vergoldeter Messing-Beistelltische hat eine Glasplatte, die am oberen Kreis befestigt ist. Sie sind sehr elegant. Italienisch, um 1970. 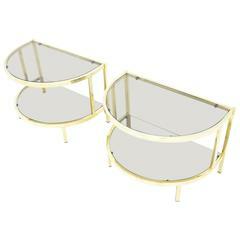 Pair of Ribbon side tables of extruded resin with gold and brass warm tones, with inset glass top. A style created by Tony Duquette, Hollywood designer. 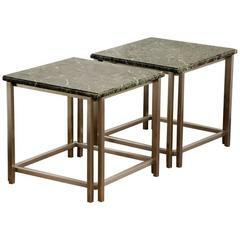 A pair of gilt metal Deco glass top tables 28.25 inches high by 23.25 inches diameter. Paar Nachttische aus Messing und Glas, 1970er Jahre. Sehr guter Zustand. Weltweiter Versand.